I am feeling pretty down today. Questioning everything about me. As in control as I may seem on the outside, I am a softie on the inside. I recently got some negative feedback from someone and it just devastated me. I am blown away. I was totally blindsided by their comments. How cruel to say those things. The first thing I do is go inside and try and figure out what I have done. When I get no clear understanding of this, the feelings take over! I hear all sorts of messages in my mind . . . “They are right!” “I am not a good leader.” “I am not worthy of leading this ministry.” “I am controlling.” “I am just an awful person!” And on and on the negative messages play out. 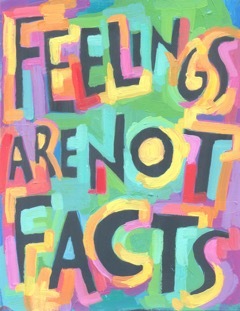 Then I have to realize these are feelings, they are not facts. They are based on their perceptions, which is their view of reality. I am owning what really does belong to them, not me. They are just their feelings from whatever place they came from or for whatever reason within them. And so, as hard as it is to sort through the stuff, I have to understand where my feelings are coming from. I ask myself some really hard questions. Have I heard this before from others? Is there any evidence that points towards what they are saying to me from other sources? Why is this upsetting me so much? Where within me does this come from? It is important for me to listen and figure out what the facts are, but I have to pick myself up and keep on going. Have you ever had to sort out this same kind of thing? When someone gives you negative feedback, is it hard for you to really understand that feelings are not facts? How do you react?